So, even as certain patterns of behavior in society seem to have changed – judging by how few contemporary Americans are able to say they have smoked on a plane or have even seen someone do it outside of cinematic recreations – the signs we collectively read as regulating that behavior remain intact. The continued appearance of no smoking signs and verbal warnings, despite the lack of potential in-flight smokers, seems to indicate that these social markers have outlived their pragmatic purpose. 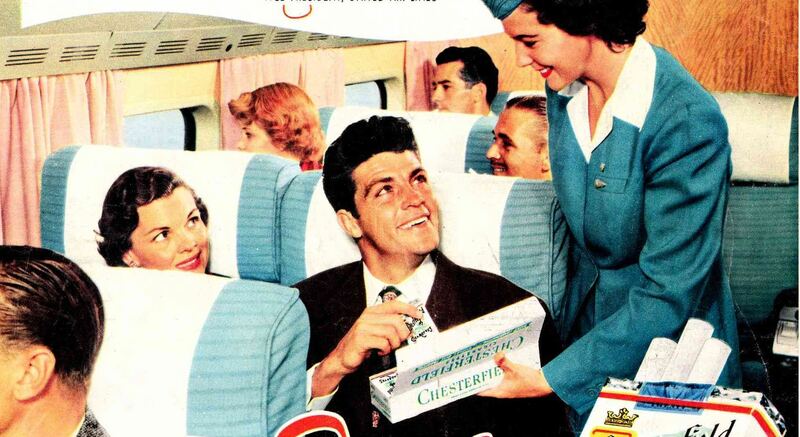 For, if we are not at risk of being exposed to secondhand smoke while traveling by air, these still prominent non-smoking indicators may instead be a way that we imagine a time when that was a possibility, simply a reminder that in-flight smoking was once a (dare I say) freedom held by previous travelers. If this is the case, and the markers warning against a behavior remain in place even after the behavior itself has disappeared, these signs may have less to do with what social actors are doing and more to do with a particular way they engage with the past. After all, non-smoking images and verbal warnings are offered only after the smoke has cleared, from an apparently safe distance in the present where travelers are merely reflecting on the threat – or liberation, depending on whom you ask – of in-flight smoking rather than participating in it. If non-smoking signs have outlived the smoking habits of current travelers, how might other images and texts we read be more complicated? It seems to me, the meaning of a sign is never singular and, instead, relies upon certain interests we bring to our reading of it. For example, a stop sign could simply be read as instructing drivers to stop. Yet, when one considers how a stop sign also reassures drivers that their fellow road-companions will stop, it becomes apparent that the utility of the sign is more complicated than it first appears. So, just as non-smoking signs can be read as functioning beyond their commonsense use, other items of material culture such as the stop sign also function on multiple levels that are not related to some self-evident or obvious meaning or effect. Reflecting critically on the values embedded in our reading of signs – as non-smoking or stop – clarifies how those descriptors are often more complicated than we might first assume.